If you run a cab business, there’s a fat chance that you’d be eager to read further. If you’re a family MUV buyer, you might still want to stop by and take a read. 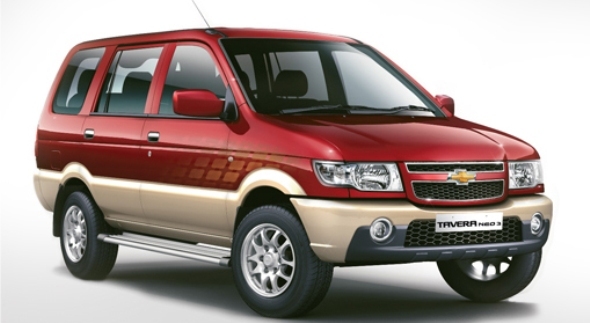 General Motors India has restarted production of the BS3 variants of the Tavera MUV, a popular choice among cab operators across the country. General Motors had stopped production of the Tavera MUV after a mammoth emission fudging scam was brought to light by a routine inspection of GM India’s Halol factory by Automotive Research Association of India, popularly called ARAI. The scam claimed its share of heads as General Motors, in a face saving move of sorts, showed many executives the door. With production resuming, expect GM India’s monthly numbers to go up as the Tavera has been a decent seller for the brand. The MUV is built at Halol, Gujarat. While the BS3 variants of the Tavera are aimed at the cab operator segment, the BS4 variants are aimed at family MUV buyers. The BS3 Tavera features a 2.5 liter turbo diesel engine that pumps out 72 Bhp-170 Nm while the BS4 variant features a 2 liter, common rail-turbo diesel engine that outputs 105 Bhp and 263 Nm, a best-in-class figure. Both engines drive the MUV’s rear wheels through five speed manual gearboxes. The Tavera is available in 7, 8 and 9 seater configurations, with the top end versions coming with captain seats for the first two rows. The Tavera received a mid life facelift last year, when GM India refreshed the MUV and equipped it with a new 2 liter turbo diesel engine to meet BS4 emission norms.